First, a definition: "TiVo service" refers to the subscription to TiVo for guide data, software updates, online scheduling, etc. 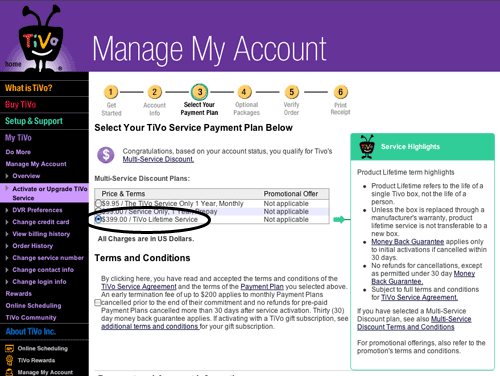 So "lifetime TiVo service" is when a customer prepays for the service instead of paying monthly or yearly for service. Some people confuse TiVo lifetime service with a TiVo lifetime product warranty - which never existed. Initially, there was confusion as to whether the lifetime service applied to the hardware, or to the customer, should they switch hardware. TiVo soon defined it to apply solely to the hardware, but added a grandfather clause stating that customer who initially purchased lifetime service before February of 2000, and whose units were still active, could move the lifetime service to a different unit once, with no fee. After that, lifetime wasn't movable from the unit under that program. When TiVo first started selling service for the first generation TiVos made by Sony and Philips, TiVo offered several service plans including lifetime, for $199. They also originally offered yearly ($99) and monthly ($9.95). Over the years, the cost of lifetime service rose, first to $249 and then to $299. Then, in the Spring of 2005, they largely stopped offering lifetime altogether. Some units here excepted from that Spring 2005 change - notably the Humax and Toshiba units that contain DVD burners. Probably due to contractual agreements with these manufacturers, TiVo kept offering lifetime service for these units at a cost of $299. Also, TiVo had at one point sold gift cards that were eligible for lifetime service for one unit. So that gift card could be redeemed on any unit, even after the Spring of 2005. For DirecTV/TiVo combo units (often called DirecTiVos), TiVo originally offered a lifetime service plan. At some point early on, DirecTV and TiVo customers stopped paying the TiVo fee to TiVo directly, and the payments became part of the DirecTV bill. At this point, DirecTV essentially assumed and honored the lifetime commitments that TiVo had made directly with customers. From that point on, customer paid their "DVR Service Fee" to DirecTV. The price for that was originally $4.99/month, and is currently $5.99/month (waived with some DirecTV plans). Contrary to the way TiVo service fees are charged for standalone users, this one fee covers all units on a customer's account. And if a current account had a lifetime TiVo, that DVR fee is now waived for the entire account, no matter the number of DVRs on the account. In 2007, soon after the release of the TiVo Series3, TiVo made available the first of several lifetime transfer offers. For $199, they allowed customers to transfer lifetime service from an older unit to a Series3 TiVo. As part of the deal, they included service on the older unit for one more year, after which point, the unit would need it's own subscription (likely as a part of the same account, and therefore eligible for the multi-service discount). During this first lifetime transfer period, any unit that had lifetime service was eligible, even DirecTiVos in many cases. The DirecTiVo eligibility ended during the program - possibly because TiVo had difficulty determining if the DirecTiVos were currently in use on the customer's account. TiVo has since followed up this promotion with similar deals involving service transfers at the same price and terms to other models including the Series2 Dual Tuner unit, and the TiVo HD unit. These later promotions had one important difference, though. For the older lifetime unit to be eligible for the transfer, the unit would have had to have had lifetime service for at least four years. This was done because for accounting reasons, TiVo Inc. amortizes the payment for lifetime service as revenue spread across four years. After that four year point, TiVo Inc. can't claim to be generating revenue from that unit. So with this program, TiVo is able to start a new revenue stream from this customer, and count them as a subscriber for four more years - possibly longer if the customer keeps the older unit in service for more time. In addition, of course, they potentially sell more units, and make current customers happy. In the Fall of 2007, TiVo made significant changes to their pricing plans. Up to this point, only the remaining DVD combo units were eligible for new lifetime service, and TiVo raised that price to $399. Then they added, for a period, the ability to add a new unit to an existing TiVo account, and get lifetime for that new unit for $399. To qualify, the customer had to have an active TiVo (not including DirecTiVos). And the unit that the customer added with lifetime had to be previously unactivated. In preparation for the holiday season of 2007, TiVo also began a promotion where a current customer could purchase a unit for a friend as a gift, with lifetime service. This applied to the TiVo HD unit, and the price was $699 for the bundle (essentially, the price of the unit itself, plus the current lifetime service cost). Lifetime service is tied to the TiVo Service Number (TSN) of the unit. The TSN is embedded in a chip on the motherboard, so changing out other parts of the unit (hard drive, power supply, faceplate) has no effect on the lifetime service. Customers who have lifetime service on a unit that has a motherboard issue need to generally have the unit service by the manufacturer in order to preserve the lifetime service. In many cases, the manufacturer will simply replace the unit, for a fee if outside warranty, with a working unit of the same model, and move the service over to the replacement unit. Only TiVo or TiVo hardware manufacturers can move service between units, and the rules only allow moves for repairs to equivalent model units. Looking to buy a unit that already has lifetime service? That's a great idea - as of 2019, lifetime costs $549. WeaKnees sells units that already have lifetime service, and that come with warranties, often for less than the $549 cost of service itself. See the TiVo DVRs with Lifetime Service page.